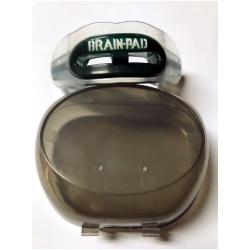 Lower jaw impacts are absorbed by the Brain-Pad's inner-injected material. New 'STRAP/STRAPLESS' design attaches to Facemask, or Shoulder-pads. 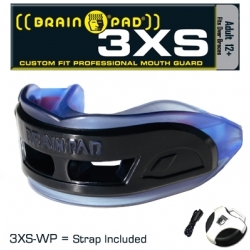 Use the Strap for football, then go strapless for sports like wrestling or MMA. Translucent Outer Thermoplastic Protects Teeth - inner material absorbs impact! Offers excellent, constant breathing! - CLENCH & BREATHE! Recommended for Hard Hitting contact sports and hard-hitting competitors. 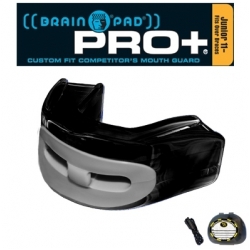 Filter: All Manufacturers Brain Pads, Inc.
A favorite mouth guard of college and Pro football teams across the USA. Also excellent in the weight room. 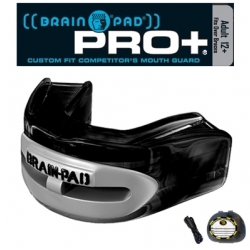 Coupled with a quality helmet, the PRO+ creates the most protective safety system for the head. 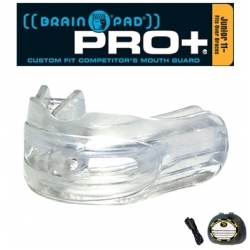 The helmet for outer head protection, and the Brain-Pad for internal head protection: Top AND bottom Teeth, TMJ sockets and Base of the skull and brain.